Compliment your coquettish grin with a pop of moisturizing coral-pink pigment and an irresistible, peach watermelon flavor. Apply lightly for a more subdued tint, or achieve a much bolder lipstick-like appearance by layering. Just like the rest of your favorite, non-tinted CannaSmack, our all natural POSH formula is infused with premium hemp seed oil, providing a kiss of vitamins A, B, D, E and Omega 3&6 fatty acids. This touch of playful elegance needs no special occasion, but can surely make any occasion feel special. Hi Gina, we are so sorry that you are having problems with your lip balm, do you live in a cold climate? The only reason I ask is because some of the natural ingredients (like beeswax) could harden significantly with cold weather, I usually like to keep mine in my pocket for a few minutes before applying during the winter. 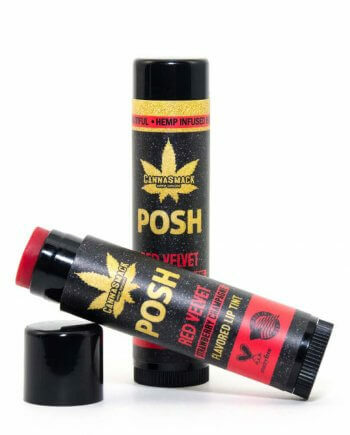 I’ve never really been a lipstick person-always lip balm-but I decided to give this tinted lip balm a try after LOVING CannaSmack’s regular lip balm. I am so happy I tried this! It keeps my lips moisturized and the color is absolutely amazing. I feel like it would look good with any skin tone.